​"There Can Be Only One"
Connor MacLeod was born in the year 1518 "in the village of Glenfinnan on the shores of Loch Shiel." In 1536, his clan is in conflict with the Clan Fraser, and Connor rides along into his first battle. The Frasers are working with a towering monster of a man known as The Kurgan who has recognized that Connor is a fellow Immortal, and hopes to use the battle to kill Connor before he becomes aware of his abilities. On the battlefield, Connor wonders why none of the Fraser's forces will attack him, until he comes across the Kurgan and is struck by an odd pain. This leaves him open to attack. The Kurgan mortally wounds Connor and prepares to decapitate him, but the MacLeod's kinsmen intervene just before this occurs, with the Kurgan vowing to return. The clan mourn Connor, but he miraculously revives shortly after his 'death'. Accusing him of witchcraft, Connor's clansmen beat him and prepare to burn him, but his cousin Angus persuades them to exile Connor instead. 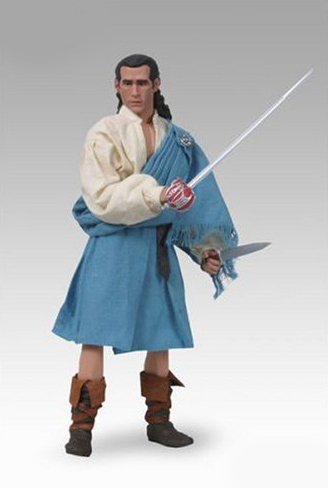 He escapes with his life, but is banished forever from his clan and birthplace. Cast: Christopher Lambert, Sean Connery, Clancy Brown, Roxanne Hart. Christopher Lambert and Sean Connery star in the epic tale of immortality that launched one of the most beloved action-adventure series in film and TV history. After Scottish clansman Connor MacLeod (Lambert) discovers his true identity as a member of a legion of immortals, he embarks on a legendary journey spanning continents and centuries, eventually landing in modern-day New York City. Connor faces his ultimate test when other immortals begin to appear in the city, leading to a titanic showdown where only one can claim victory. Directed by Russell Mulcahy and featuring a soundtrack by Queen, this is the modern classic that has attracted millions of warrior fans worldwide. ​The Series is a fantasy-adventure television series featuring Duncan MacLeod (Adrian Paul) of the Scottish Clan MacLeod, as the Highlander. It was an offshoot and another alternate sequel of the 1986 feature film with a twist: Connor MacLeod did not win the prize and Immortals still exist post-1985. In fact, original Highlander star Christopher Lambert appeared in the Pilot episode so as to pass the torch to Adrian Paul. The series was an international hit and was nominated three times for the Gemini Awards and once for a Saturn Award in 1998. 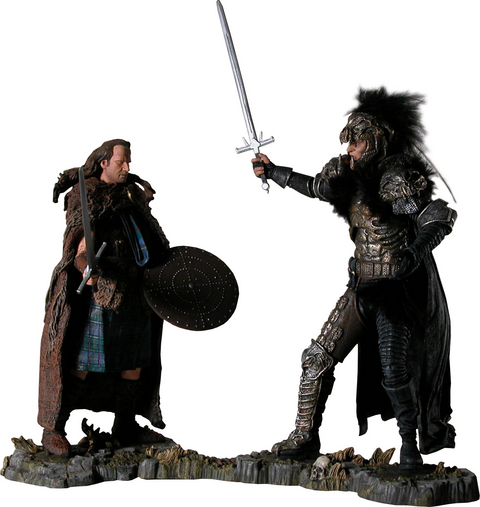 Highlander Movie & Television Prop Peplicas, Figures, Toys and Collectibles! 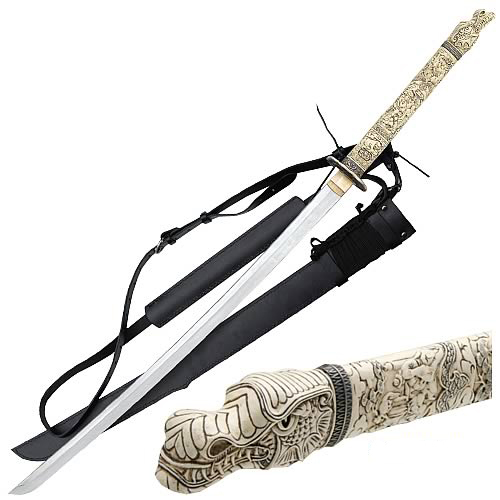 This superlative sword is an authentic replica of Immortal Connor MacLeod's katana. It measures 40 1/4-inches long. For the first time, these iconic weapons are being made with genuine hand-forged carbon-steel blades and authentically detailed faux-ivory handles. The handle grips are cast one-piece hardened resin, to precisely match the look, feel, and weight of real aged ivory. The blade is constructed from 1045 forged carbon steel and measures 28-inches. Includes a hardwood sheath with leather baldric. This sword has been one of the most recognized pieces in the Highlander® weapons collection. The leather wrapped grip is surrounded by cast metal handle parts. The retracting blade spikes are operated by the push of a button just like the actual prop. The massive blade offers a clean mirror polished finish. Includes certificate of authenticity. 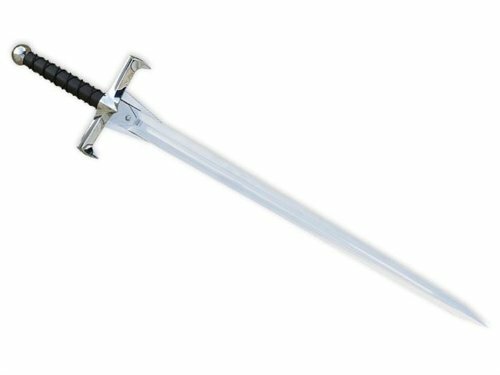 This massive two-hand sword is a fully licensed authentic replica from the popular Highlander® movies and television series. 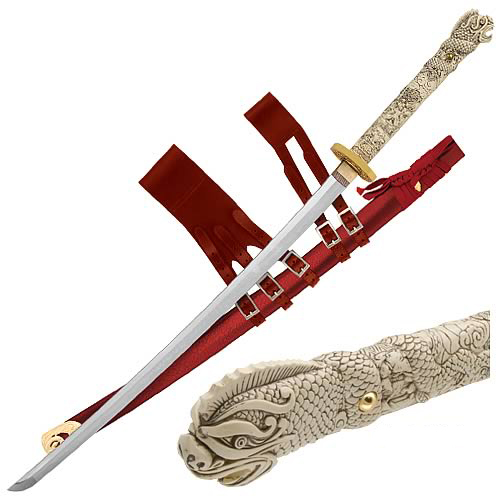 This superlative sword is an authentic replica of Immortal Duncan MacLeod's katana. It measures 40-inches long. For the first time, these iconic weapons are being made with genuine hand-forged carbon-steel blades and authentically detailed faux-ivory handles. The handle grips are cast one-piece hardened resin, to precisely match the look, feel, and weight of real aged ivory. The blade is constructed from 1045 forged carbon steel and measures 27-inches. Includes leather sheath with shoulder harness. 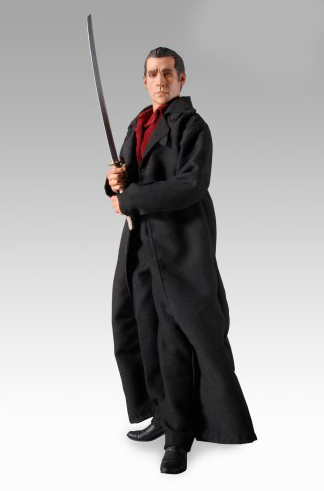 30 points of articulation Duncans dragons head Katana, crafted by Hideo Koto Clan Chief Ian MacLeods Claymore Sunglasses 12 figure display base with Highlander logo/Duncan MacLeod, clansman of Connor MacLeod, is an Immortal who has lived over four hundred years. 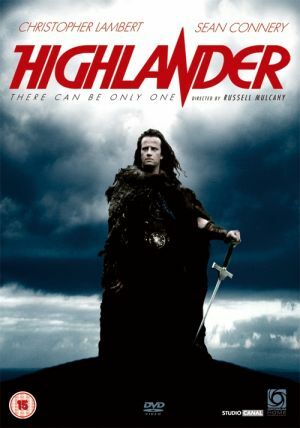 The Highlander television series follows Duncan MacLeod (Adrian Paul) through his modern and historical adventures and his encounters with other Immortals. Duncan discovers a secret society of Watchers, whose primary purpose is to record the stories of the Immortals, although some Watchers have taken it upon themselves to cleanse the world of the Immortals and their influence. Duncan has awkward allegiances and true friendships with other Immortals, including a younger immortal named Richie, and learns the dangers of love with mortal women. Duncans world is a dangerious landscape of friends, lovers, enemies, and allies, but in the end, there can be only one. 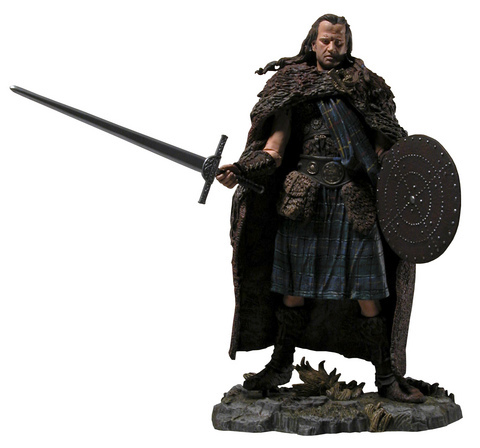 Duncan MacLeod, clansman of Connor MacLeod, is an Immortal who has lived over four hundred years. 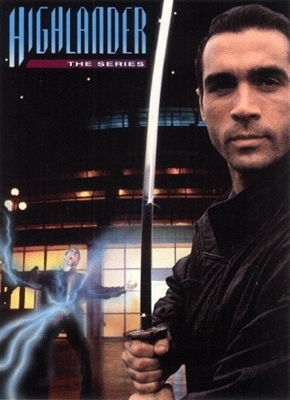 The Highlander television series follows Duncan MacLeod (Adrian Paul) through his modern and historical adventures and his encounters with other Immortals. Duncan discovers a secret society of Watchers, whose primary purpose is to record the stories of the Immortals, although some Watchers have taken it upon themselves to cleanse the world of the Immortals and their influence. Duncan has awkward allegiances and true friendships with other Immortals, including a younger immortal named Richie, and learns the dangers of love with mortal women. Duncan's world is a dangerious landscape of friends, lovers, enemies, and allies, but in the end, there can be only one. 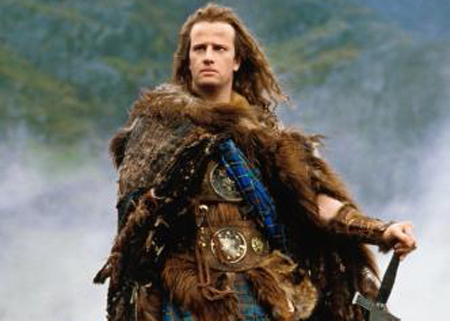 Christopher Lambert as Connor MacLeod, a 16th-century immortal born in Glenfinnan, Scotland near the shores of Loch Shiel. Under the alias Russell Nash, he lives and works as an antiques dealer in present-day New York. Sean Connery as Juan Sánchez Villa-Lobos Ramírez, an Egyptian immortal. Born Tak-Ne in 896 BC, he became an immortal after being run down by an out-of-control horse and cart. At the time of meeting Connor, he was living in Spain and working as the Chief Metallurgist to King Charles V. He is beheaded in 1542 while fighting the Kurgan. 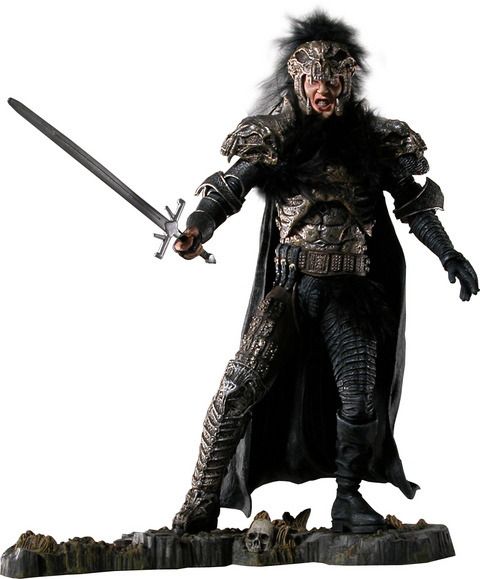 ​Clancy Brown as The Kurgan, a Russian immortal living under the alias Victor Kruger. Born on the border of the Caspian Sea in the 10th century BC, he was a member of the Kurgan tribe. He travels to New York with the intention of killing the few remaining immortals and claiming the "prize".